The T346 is a compact 4-channel, 32 MHz waveform generator. It incorporates four DDS waveform synthesizers that may be used independently or synchronously to produce coherent signals. Waveforms include sine, triangle, sawtooth, Gaussian noise, and precision pulse/PWM outputs. User-loaded arbitrary waveforms may be generated. Test relays allow any output to be diverted to a test connector for in-system calibration verification. Built-In-Self-Test is provided. 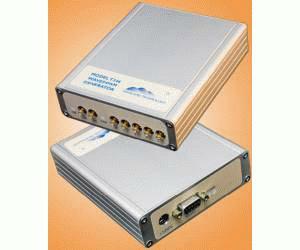 Four additional waveform generators are provided internally as modulation/summing sources. Channel-channel modulation capability allows generation of sweeps, chirps, I/Q and constellations, and calibrated jitter, and simulation of a wide range of radar, communications, power, encoders, and electro-mechanical systems. The T34x family of generators includes the T340 and T346.